Q: On the Chinese citizen shot dead by the French police. An investigation has been launched into the case by the French authorities. They said the safety of all Chinese citizens in France is a priority. Are you satisfied with this statement? Will China support Chinese communities in France to protest over this? A: Thank you for raising this question. In recent days, the Chinese foreign ministry as well as the Chinese embassy in France have been in close contact with relevant authorities of the French government over this incident, which is closely followed by the people of both China and France. On March 28, the Department of Consular Affairs of the Chinese foreign ministry and the Chinese embassy in France lodged representations in emergency meetings respectively with officials of the French embassy in China, the French interior ministry and the French police. In those meetings, the Chinese side expressed its serious concerns over the incident and asked the French side to get to the bottom of the incident and release results of investigation as soon as possible. The Chinese side also requested the French government to understand the reactions of overseas Chinese in France to the incident, exercise restraint, avoid clashes that could escalate the situation, and actively respond to the reasonable demands and needs of relevant people. We hope that the French side will take concrete and effective measures to protect the safety and lawful rights and interests of Chinese citizens in France. Officials of both the French foreign ministry and interior ministry have said that they will deal with the incident seriously and complete the investigation as soon as possible to inform the public of the truth. According to notification from the French side, the police officers involved in the incident have been suspended from their duties for investigation, and most of the people arrested for clashing with police in a petition rally have been released. We also noticed the statement by the spokesperson of the French foreign ministry that the French side is investigating the incident and the safety of all Chinese citizens in France is a priority. The French government has taken enhanced measures in recent months to make overseas Chinese in France feel as welcomed and safe as possible. The Chinese foreign ministry and the Chinese embassy in France will continue to closely follow the developments and urge the French side to properly handle the incident. At the same time, we continue to hold the position that overseas Chinese in France need to defend their rights in a legal and reasonable manner. Q: It is reported that Russian foreign minister Sergey Lavrov said on March 28 that both Russia and China oppose the deployment of US missile defense system in the ROK, and that the move by the US to strengthen its missile defense system, including deploying THAAD, will negatively affect regional security. On the same day, the Chinese military and Russian military held the second joint briefing on anti-missile issues in Geneva, stating their common position on missile defense and THAAD. Does China also believe that the US plans to enhance its global missile defense capability by deploying THAAD in the ROK? A: The Chinese government always believes that the anti-missile issue must be handled with caution as it concerns global strategic stability and mutual trust between major countries. While pursuing their own national security interests, countries should also respect the security concerns of others. Countries should follow the principle of maintaining global strategic stability and undiminished security for all, and work together to maintain an international security environment featuring peace, stability, equality, mutual trust and win-win cooperation. If any country unilaterally pursues absolute security of itself by advancing global deployment of its missile defense systems, it will gravely impede the nuclear disarmament process, provoke confrontation or even arms race, and thus jeopardize global and regional strategic stability and balance. Q: Yesterday, the Chinese Ambassador in Australia and the Australian Foreign Minister had a meeting over Australia's failure to pass the extradition treaty. The Australian media reports said that the Chinese Ambassador expressed his disappointment over Australia's decision. Can you confirm and provide more details? A: In fact, China-Australia extradition treaty was signed ten years ago in 2007. The Chinese side ratified this treaty in April, 2008, while the Australian side has yet to ratify it. We have publicly stated that an early entry into force of the treaty is in line with the interests of both China and Australia, as it would provide institutional support to the joint efforts by the two sides to fight transnational crimes and promote judicial and law enforcement cooperation. China-Australia relations are now enjoying a good momentum with practical cooperation in various fields moving forward steadily. We hope Australia can bear in mind the picture of our bilateral ties and our mutual interests, and continue to proceed with relevant domestic procedures, so that the treaty can come into force as soon as possible. We should do our best to ensure our cooperation brings more real benefits to our two peoples. Q: According to media reports, the US Supreme Court on March 27 rejected an appeal filed by Japanese Americans demanding the local government to remove a comfort woman statue in Los Angeles. Before that, the Japanese government submitted its legal opinions letter to the court, but the letter was directly rejected. With regard to this case, Chief Cabinet Secretary of Japan Yoshihide Suga said that Japan felt highly regretful and would continue to appropriately explain the comfort women issue and seek understanding. What is your comment? A: We have noticed relevant reports and commend the ruling. The forced recruitment of comfort women is a grave crime against humanity committed by Japanese militarists during World War II, inflicting untold sufferings on the people of victimized countries in Asia. There is solid and undeniable evidence of this crime. We feel that the international community should be highly alert to the fact that Japan still cannot treat the history issues with a right attitude and even unreasonably obstructs righteous moves by members of the international community. Q: According to media reports, on March 27, a woman, who seemed to be from Taiwan, was allowed entry at the Tokyo Haneda Airport holding a passport attached with a "Republic of Taiwan" sticker. What is your comment? A: Spokesperson of the Taiwan Affairs Office of the State Council has responded to this issue from the perspective of cross-Straits relations. From the perspective of the foreign ministry, I want to state that the Chinese government opposes all forms of acts to seek "Taiwan independence" and that upholding the "one China" principle is a consensus broadly recognized by the international community. If some individual country plays petty tricks over this issue, it only further proves that it is at odds with the mainstream international consensus. The Chinese people remains highly vigilant. The Chinese side has lodged representations with the Japanese side over the relevant issue, asking the Japanese side to strictly stick to their commitments and not give any chance or space to any acts by those who seek "Taiwan independence". Q: After the 2014 APEC Economic Leaders' Meeting in China, President Obama announced a climate change agreement with President Xi Jinping where both countries would cut greenhouse gas emissions by nearly a third over the coming two decades. Yesterday, President Trump signed an executive order, rolling back many of his predecessor's climate change policies and making it questionable if the US could be able to meet these goals. Will China go ahead alone and meet those goals unilaterally if the US doesn't? Will China seek to get the US to come back with stronger climate change goals? Will this subject be on the agenda in a potential President Xi-President Trump meeting in the coming weeks? A: I do not have any information for you yet on the meeting between the presidents of China and the US. We also noticed the reports regarding the climate change issue. Climate change is a challenge to all mankind. The Paris Agreement is a milestone of global climate governance. It embodies the broadest consensus of the international community and has ushered the world into a new historical stage of green development. We believe that the Paris Agreement did not come by easily, members of the international community, including China and the US, have made tremendous contributions to form this high-level consensus. We still believe that relevant sides should follow the trend of the times, seize the opportunity, honor their commitments and take active measures to promote the implementation of this agreement. You may have noticed that in President Xi's speech at the UN office at Geneva, he said that China would continue to take steps to tackle climate change and fully honor its obligations. No matter how the climate policies of other countries may evolve, China, as a responsible major developing country, will not change its determination, targets or policy measures in tackling climate change. We also stand ready to strengthen dialogue and cooperation with members of the international community to promote global climate governance, so that we can promote green, low-carbon and sustainable development of the world and create a better future for the future generations. Q: Yesterday there were tensions at the Chinese mobile company OPPO's office in New Delhi between Chinese staff and Indian employees over problem related to defiling India's national flag. Indian police said that they were investigating this incident. What is your comment? A: We noticed relevant reports. As I know, OPPO's office is in touch with the local police regarding this incident. We hope it can be properly resolved as soon as possible. The Chinese government has always asked Chinese companies and their staff to respect local laws and regulations as well as customs and traditions when they do business overseas. At the same time, we hope the host countries can protect the lawful rights and interests of Chinese companies and their staff in accordance with law. Q: The Taiwan Affairs Office of the State Council responded today to the case of a Taiwan resident named Li Mingzhe being investigated by authorities of the mainland. Do you know his location and who is doing the investigation? A: This question does not concern diplomacy. Affairs in the mainland, Hong Kong, Macau and Taiwan are all internal affairs of China. Therefore questions over these affairs are not within our remit. Q: According to Malaysian newspaper, Kim Jong-Nam's body would be sent back to Macau on Thursday. Can you confirm that? Are the Chinese authorities in touch with the Malaysian authorities on this? A: I cannot confirm that. For the Chinese government, we hope relevant sides can find a proper solution through friendly consultation. Q: The National Security Adviser to the Philippine President implied while giving testimony to the Philippine parliament today that perhaps China was indeed carrying out survey work in Benham Rise. China said that the ship was carrying out innocent passage. Did China have permission to carry out survey work in waters above Benham Rise? What is the purpose of this survey? 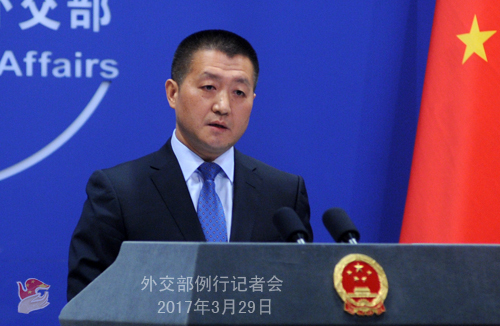 China fully respects the right of the Philippines to the continental shelf of Benham Rise. There is no such occasion as China challenging relevant rights of the Philippines. Late last year, China's scientific research vessel did pass relevant waters northeastern to the Luzon island of the Philippines. The Chinese vessel enjoys freedom of navigation and right to innocent passage as entitled by international laws such as the United Nations Convention on the Law of the Sea. 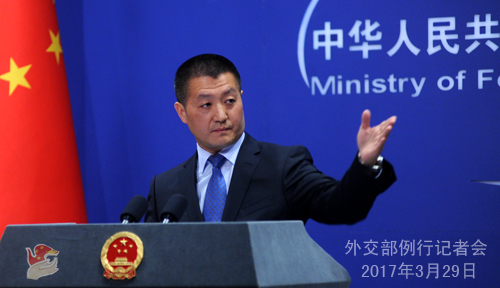 The allegation that the Chinese vessel was carrying out survey work or other activities in waters of Benham Rise is completely groundless. Sino-Philippine relations now enjoy a sound growth momentum thanks to collective efforts of the two sides. Our practical cooperation is moving forward quickly with remarkable achievements. Such progress is in line with the common interests of the two countries and the two peoples, and is desired by regional countries and the majority peace-loving countries in the world. Q: The security situation in Xinjiang seems to be quite tense at the moment. There are a lot of anti-terrorism drills going on. There also has been increasing criticism from foreign human rights groups over what they see as repression in Xinjiang aimed at the Uyghur people with Muslim faith in particular. Is there repression in Xinjiang? Is the Chinese government seeking to repress the Muslim faith in Xinjiang? A: The foreign groups you mentioned, whatever they boast themselves as, be it human rights groups or else, comment on the situation in Xinjiang quite often. But whatever they say, the objective fact is that the people of all ethnicities in Xinjiang, just like the people living in other regions of China, are enjoying better lives, working conditions and brighter prospect for development. Peace and stability in Xinjiang would not be changed by whatever words from these foreign groups. Of course, should anyone intends to create tensions in Xinjiang, they should know that the determination of the Chinese government to safeguard social stability and the peaceful life of people living and working there is unquestionable. With respect to counter-terrorism, I can tell you that China upholds an important principle in fighting terrorism. We oppose the approach of linking terrorism with a certain ethnicity or a certain religion. This principle is also one of the widely-recognized rules for international counter-terrorism cooperation. Q: KCNA announced today that Air Koryo has started a new charter flight route twice a week from Pyongyang to Dandong in China. Given that earlier this year, the ROK was refused permission to operate some charters between the ROK and China which many people talked as China's disapproval of the THAAD deployment in the ROK. Is the approval of the charter route sending an odd signal to the international community? A: China and the DPRK are normal friendly neighbors. Although we oppose the development of nuclear weapons by the DPRK, it is beyond criticism for the two countries to maintain normal state-to-state relations. I don't see any logic if someone insists on connecting this with other issues. With respect to THAAD, my colleagues and I have reiterated our position many times. The government and people of China unswervingly oppose the US deployment of the THAAD missile defense system in the ROK.